Nuclear power in Canada is provided by 19 commercial reactors with a net capacity of 13.5 Gigawatts (GWe), producing a total of 95.6 Terawatt-hours (TWh) of electricity, which accounted for 16.6% of the country's total electric energy generation in 2015. All but one of these reactors are located in Ontario where they produced 61% of the province's electricity in 2016 (91.7 TWh). Seven smaller reactors are used for research and to produce radioactive isotopes for nuclear medicine. The nuclear industry (as distinct from the uranium industry) in Canada dates back to 1942 when a joint British-Canadian laboratory, the Montreal Laboratory, was set up in Montreal, Quebec, under the administration of the National Research Council of Canada, to develop a design for a heavy-water nuclear reactor. This reactor was called the National Research Experimental (NRX) reactor and would be the most powerful research reactor in the world when completed. ZEEP (left), NRX (right) and NRU (back) reactors at Chalk River, 1954. In 1944, approval was given to proceed with the construction of the smaller ZEEP (Zero Energy Experimental Pile) test reactor at Chalk River, Ontario and on September 5, 1945 at 3:45 p.m., the 10-watt ZEEP achieved the first self-sustained nuclear reaction outside the United States. 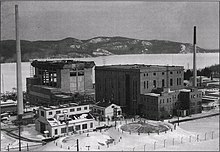 In 1946, the Montreal Laboratory was closed, and the work continued at the Chalk River Nuclear Laboratories. Building partly on the experimental data obtained from ZEEP, the National Research Experimental (NRX)—a natural uranium, heavy water moderated research reactor—started up on July 22, 1947. It operated for 43 years, producing radioisotopes, undertaking fuels and materials development work for CANDU reactors, and providing neutrons for physics experiments. It was eventually joined in 1957 by the larger 200 megawatt (MW) National Research Universal reactor (NRU). From 1967 to 1970, Canada also developed an experimental miniature nuclear reactor named SLOWPOKE (acronym for Safe LOW-POwer Kritical Experiment). The first prototype was assembled at Chalk River and many SLOWPOKEs were built, mainly for research. Two SLOWPOKEs are still in use in Canada and one in Kingston, Jamaica; one has been running at École Polytechnique de Montréal since 1976, for instance. In 1952, the Canadian government formed Atomic Energy of Canada Limited (AECL), a Crown corporation with the mandate to develop peaceful uses of nuclear energy. A partnership was formed between AECL, Ontario Hydro and Canadian General Electric to build Canada's first nuclear power plant, Nuclear Power Demonstration (NPD). The 20 MWe NPD started operation in June 1962 and demonstrated the unique concepts of on-power refueling using natural uranium fuel, and heavy water moderator and coolant. These features formed the basis of a fleet of CANDU power reactors (CANDU is an acronym for CANada Deuterium Uranium) built and operated in Canada and elsewhere. Starting in 1961, AECL led the construction of 24 commercial CANDU reactors in Ontario, Quebec, and New Brunswick. Bruce B (front) and Douglas Point (white dome) nuclear power plants. The first full-scale CANDU reactor entered service on September 26, 1968, at Douglas Point on the shore of Lake Huron in Ontario. Two years later a reactor of comparable power but of a different design became operational along the Saint Lawrence River in Quebec. Gentilly-1 was a prototype CANDU-BWR reactor with features intended to reduce its cost and complexity. After the equivalent of only 180 on-power days over nearly seven years (a 5.7% lifetime capacity factor), Gentilly-1 was closed in June 1977. Douglas Point, also suffering from unreliability with a lifetime capacity factor of 55.6%, was deemed a financial failure and shut down in May 1984. In August 1964, Ontario Hydro decided to build the first large scale nuclear power plant in Canada at Pickering on Lake Ontario, only 30 kilometres from downtown Toronto to save on transmission costs. To reduce cost the reactors share safety systems including containment and the emergency core cooling system. Pickering A station started operations in 1971 at a cost of $716 million (1965). It was followed by the Bruce A station, built in 1977 at a cost of $1.8 billion on the same site as the Douglas Point reactor. Beginning in 1983 four B reactors were added to the existing Pickering units, with all of them sharing the same common infrastructure as the A reactors. The final cost for these four new reactors was $3.84 billion (1986). Likewise for $6 billion, four new reactors were added to the Bruce site starting in 1984, but in a separate building with their own set of shared infrastructure for the new reactors. After a loss of coolant accident occurred at Pickering reactor A2 in August 1983, four of the reactors had their pressure tubes replaced between 1983 and 1993 at a cost of $1 billion (1983). Gentilly-1 (right) and 2 (left) nuclear reactors. As most of the development of nuclear energy was taking place in Ontario, Quebec nationalists were eager to benefit from a promising technology. Hydro-Quebec initially planned to build as many as 40 reactors in the province, but the government chose to pursue hydroelectric mega-projects instead (see the James Bay Project). At the end of the 1970s, public opinion about nuclear energy shifted, and only one new reactor at Gentilly was operational by 1983. The same year, another reactor began operation at Point Lepreau, New Brunswick, a province longing to diversify its energy sources since the oil crisis of 1973. In 1977, a new plant close to Toronto, Darlington, was approved for completion in 1988 at an estimated cost of $3.9 billion (1978). After much controversy the last unit came into service five years late. By then the cost had ballooned to $14.4 billion (1993). In the wake of this cost, a Darlington B plant was cancelled. At this point, the operating Canadian reactors fleet consisted of eight units at the Pickering site, eight units at the Bruce site, four units at the Darlington site, one unit at Gentilly in Quebec, and one unit at Point Lepreau in New Brunswick for a 14.7 GWe net total operational installed capacity. By 1995 the Pickering and Bruce A units needed refurbishment as after 25 years effective full power years of operation, the embrittled fuel channels face an increased risk of rupture and must be replaced. The first reactor to close was Bruce A unit 2 in November 1995 because of a maintenance accident. After criticism of Ontario Hydro plants management and a series of incidents, on December 31, 1997, the four A reactors at Pickering and unit 1 at Bruce A were abruptly shut down. They were followed by the remaining two Bruce A units three months later. Over 5 GW of Ontario's electric capacity was abruptly shut down, but at this point, the reactors were supposed to restart at six-month intervals starting in June 2000. In 1999, indebted Ontario Hydro was replaced by Ontario Power Generation (OPG). The next year, OPG leased its Bruce A and B nuclear stations to Bruce Power, a consortium led by British Energy. Pickering's A4 and A1 reactors were refurbished from 1999 to 2003 and from 2004 to 2005, respectively. To prevent a power shortage while phasing out Ontario's coal-burning plants, Bruce A units 3 and 4 were returned to service in January 2004 and October 2003 respectively, and then units 1 and 2 were completely refurbished for $4.8 billion (2010). Of the eight units laid down, four were refurbished, two were restarted without refurbishment, and two (Pickering A2 and A3) were definitively shut down. In April 2008, refurbishment began at Point Lepreau and had been estimated to be completed in September 2009 at a cost of $1.4 billion. Plagued by delays, the work was finalized three years late and largely over budget. Hydro-Quebec had decided in August 2008 to similarly refurbish Gentilly-2 starting in 2011. Because of delays with the Point Lepreau rebuild, and for economic reasons in a province with hydroelectricity surpluses, the plant was permanently shut down in December 2012. It should remain dormant 40 more years before being dismantled. Following the 2011 Japanese nuclear accidents, the Canadian Nuclear Safety Commission (CNSC) ordered all reactor operators to revisit their safety plans and report on potential improvements by the end of April 2011. The International Atomic Energy Agency (IAEA) later conducted a review of the CNSC's response to the events at Japan's Fukushima Daiichi Nuclear Power Plant, and concluded that it was "prompt, robust and comprehensive, and is a good practice that should be used by other regulatory bodies". In 2012, OPG decided not to refurbish the six poorly performing Pickering reactors and to permanently turn them off by 2020. Instead the more recent Darlington reactors will gradually undergo a $12.8 billion complete refurbishment scheduled to take place between October 2016 and 2026. Bruce Power will follow the same plan for its six not yet refurbished Bruce units 3 to 8. This even more massive undertaking should start in 2020 and cost $13 billion. The ten revamped reactors should then be operating until at least 2050. To compensate for the programmed shut down of numerous reactors, the Government of Ontario decided in January 2016 to push the retirement date of the Pickering plant to 2024. Rising fossil fuel prices, an ageing reactors fleet, and new concerns about reducing greenhouse gas combined to promote the building of new reactors throughout Canada during the early 2000s. However, what was seen as a nuclear renaissance petered, and no new construction has started. In August 2006, Bruce Power applied for a licence to prepare its Bruce site for the construction of up to four new nuclear power units. In July 2009, the plan was shelved as a declining demand for electricity did not justify expanding production capacity. Bruce Power prioritized refurbishing its A and B plants instead. In September 2006, OPG applied for a licence to prepare its Darlington site for the construction of up to four new nuclear power units. The reactor designs being first considered for this project were AECL's ACR-1000, Westinghouse's AP1000 and Areva's EPR. In 2011 the Enhanced CANDU 6 entered the competition and soon became OPG's favorite. On August 17, 2012, after environmental assessments, OPG received a Licence to Prepare Site from the CNSC. In 2013 the project was put on hold as OPG decided to concentrate on refurbishing the existing Darlington units. Energy Alberta Corporation announced 27 August 2007 that they had applied for a licence to build a new nuclear plant in Northern Alberta at Lac Cardinal (30 km west of the town of Peace River), for two ACR-1000 reactors going online in 2017 as steam and electricity sources for the energy-intensive oil sands extraction process, which uses natural gas. However, a parliamentary review suggested placing the development efforts on hold as it would be inadequate for oil sands extraction. Three months after the announcement, the company was purchased by Bruce Power who proposed expanding the plant to four units for a total 4 GWe. These plans were upset and Bruce withdrew its application for the Lac Cardinal in January 2009, proposing instead a new site 30 km north of Peace River. Finally, in December 2011, the controversial project was abandoned. The Government of Saskatchewan was in talks with Hitachi Limited's Power Systems about building a small nuclear plant in the province involving a five-year study beginning in 2011. A study in 2014 showed public support for nuclear power and highlighted a reliable supply of uranium ore in the province, but the province has not been eager moving forward and no site has been identified since 2011. In August 2007, a consortium named Team CANDU began a feasibility study regarding the installation of an Advanced CANDU Reactor at Point Lepreau, to supply power to the eastern seaboard. July 2010, the Government of New Brunswick and NB Power signed an agreement with Areva to study the feasibility of a new light water nuclear unit at Point Lepreau but a newly elected government two months later shelved the plan. A number of Canadian startups are developing new commercial nuclear reactor designs. In March 2016, the Oakville, Ontario-based company Terrestrial Energy was awarded a $5.7 million grant by the Government of Canada to pursue development of its small IMSR Molten Salt Reactor. Thorium Power Canada Inc., from Toronto, is seeking regulatory approvals for a Thorium fuelled compact demonstration reactor to be built in Chile that could be used to power a 20 million-litre/day desalination plant. Since 2002, General Fusion, from Burnaby, British Columbia, has raised $100 million from public and private investors to build a fusion reactor prototype based on magnetized target fusion starting in 2017. Beginning in 1958, Canada built 25 nuclear power reactors over the course of 35 years, with only three of them located outside of Ontario. This made the southern part of the province one of the most nuclearized areas in the world with 12 to 20 operating reactors at any given time since 1987 inside a 120-kilometre radius. All of the Canadian reactors are concentrated in only seven different sites, with two of them (Pickering and Bruce) being the largest nuclear generating stations in the world by total reactor count. The Bruce site, with eight active reactors and one shut down (Douglas Point) has been the largest operating nuclear power station in the world by total reactor count, the number of currently operational reactors, and total output since 2012. All of the reactors are of the PHWR type. Because CANDU reactors can be refueled while operating, Pickering unit 3 achieved the then highest capacity factor in the world in 1977 and Pickering unit 7 held the world record for continuous operation without a shutdown (894 days) from 1994 to 2016. Overall, PHWR reactors had the best lifetime average load factor of all western generation II reactors until being superseded by the PWR in the early 2000s. First nuclear reactor in Canada, and first outside the United States. One of the highest flux reactors in the world. Research and medical isotope production. Research and medical isotope production. ZED-2 Tank 0.2 1958-12-01 1960-09-07 Operational Zero-power research reactor. SLOWPOKE 5 1970 Moved 1971 Prototype. Moved to University of Toronto. MAPLE I Tank in pool 10 000 1997-12-01 2000 Cancelled 2008 Medical isotope production reactors. McMaster University - Hamilton, Ontario MNR MTR 5 000 1957-09-01 1959-04-04 Operational Operating at 3 MWt. Organic cooled prototype. Plant had coolant leak of 2,739 litres in November 1978. SDR SLOWPOKE-3 2 000 1985 1987-07-15 Shut down 1989 Slowpoke Demonstration Reactor for district heating. Tunney's Pasture - 20 Goldenrod Avenue, Ottawa, Ontario SLOWPOKE 20 1970 1971-05-14 Shut down 1984 Prototype. University of Toronto Haultin Building - Toronto, Ontario SLOWPOKE 5 1971 1971-06-05 Dismantled 1976 Power increased to 20kWt in 1973. École Polytechnique de Montréal - Montreal, Quebec SLOWPOKE-2 20 1975 1976-05-01 Operational Converted to Low-Enriched Uranium (LEU) fuel. Royal Military College - Kingston, Ontario SLOWPOKE-2 20 1985-08-20 1985-09-06 Operational First Low-Enriched Uranium (LEU) fueled. 24 May 1958, a fuel rod caught fire and ruptured as it was being removed from the NRU reactor leading to the complete contamination of the building. As in 1952, the military was called in to aid and approximately 679 people were employed in the clean-up. In November 1978 a loss of coolant accident affected the experimental WR-1 reactor at Whitshell Laboratories in Pinawa, Manitoba. 2,739 litres of coolant oil (terphenyl isomer) leaked, most of it into the Winnipeg River, and three fuel elements broke with some fission products being released. The repair took several weeks for workers to complete. On December 10, 1994, a pipe break at Pickering reactor 2 resulted in a major loss of coolant accident and a spill of 185 tonnes of heavy water. The Emergency Core Cooling System had to be used to prevent a core meltdown. It has been called "the most serious nuclear accident in Canada" by The Standing Senate Committee on Energy, the Environment and Natural Resources in 2001. In 2009, more than 200,000 litres of water containing trace amounts of tritium and hydrazine spilled into Lake Ontario after workers accidentally filled the wrong tank with tritiated water. However the level of the isotope in the lake was not enough to pose harm to residents. On December 13, 2011, a radioactive spill happened at New Brunswick's Point Lepreau nuclear generating station during refurbishment. Up to six litres of heavy water splashed to the floor, forcing an evacuation of the reactor building and halt of operations. Then, on December 14, NB Power issued a news release, admitting there had been another type of spill three weeks earlier. CANDU type reactors operating in Canada have the particularity of being able to use natural uranium as fuel because of their high neutron economy. Therefore the costly fuel enrichment step required by the more prevalent light-water reactor types can be avoided. However this comes at the cost of heavy water usage which, for example, represented 11% ($1.5 billion) of the capital costs of the Darlington plant. The low uranium-235 density in natural uranium (0.7% 235U) compared with enriched uranium (3-5% 235U) implies that less fuel can be consumed before the fission rate drops too low to sustain criticality, explaining why fuel burn-up in CANDU reactors (7.5 to 9 GW.day/tonnes) is far lower than in PWR reactors (50 GW.d/t). Therefore, a lot more fuel is used and consequently a lot more spent fuel is produced by CANDUs for a given quantity of energy produced (140 t.GWe/year for a CANDU vs 20 t.GWe/year for a PWR). Yet mined uranium utilization is lower by almost 30% in a CANDU because there is no wasteful enrichment step during the ore processing into fuel. Paradoxically heavy-water reactors in Canada use less uranium but produce more spent fuel than their light water counterparts. In 2009, Canada had the 4th largest recoverable uranium reserves in the world (at a cost of less than 130 USD/kg) and was up until that date the world's largest producer. The only currently active mines and most prominent uranium reserves are in the Athabasca Basin of northern Saskatchewan. Cameco's McArthur River mine, opened in 2000, is both the largest high-grade uranium deposit and the largest producer in the world. Approximately 15% of Canada’s uranium production is used to fuel domestic reactors, the rest being exported. Uranium ore concentrate (yellowcake) from mines in Canada and elsewhere is processed into uranium trioxide (UO3) at Cameco's Blind River plant, the world’s largest commercial uranium refinery. This purer form of uranium is the raw material for the next stage of processing happening in Port Hope, Ontario. There, Cameco's conversion facility produces uranium hexafluoride (UF6) for foreign uranium enrichment facilities and uranium dioxide (UO2) for local fuel manufacturers. Cameco's Port Hope and BWXT's Peterborough and Toronto fuel manufacturing facilities turns uranium dioxide powder into ceramic pellets before sealing these into zirconium tubes to form fuel rods assembled into bundles for CANDU reactors in Canada and elsewhere. Like in the USA or Finland, the policy of Canada is not to reprocess spent nuclear fuel but to directly dispose of it for economic reasons. In 1978, the government of Canada launched a nuclear fuel waste management program. In 1983 an underground laboratory was constructed at Whiteshell Laboratories in Manitoba to study the geological conditions associated with the storage of spent nuclear fuel. The 420-metre deep facility was decommissioned and deliberately flooded in 2010 to perform one final experiment. In 2002 the Nuclear Waste Management Organization (NWMO) was founded by the industry to develop a permanent waste strategy. Canadian Nuclear Laboratories (CNL) plans to build a 1 million m³ Near Surface Disposal Facility (NSDF) at the Chalk River site to dispose of its low-level radioactive waste beginning in 2020. Low-level and intermediate-level radioactive waste produced by the three Ontario nuclear power plants in operation are managed by the Western Waste Management Facility (WWMF) located at the Bruce nuclear site in Tiverton, Ontario. OPG is proposing to build a deep geological repository adjacent to the WWMF to serve as a long-term storage solution for about 200,000 m³ of this waste. The Deep Geologic Repository would be dug 680 metres below the surface in an argillaceous limestone layer isolated beneath 200 metres of shale. As of June 2015, Canadian reactors had produced 2.6 million spent fuel bundles or around 52,000 tonnes of high-level waste, the second largest amount in the world behind the USA. This number could grow to 5.2 million bundles (103,000 tonnes) at the end of the planned life of the current reactors fleet. Spent fuel is stored at each reactor sites either in fuel pools (58% of the total) or dry cask storage (42%) when it is cool enough. Although more spent fuel is produced by CANDU reactors, dry storage costs for a given electricity production are comparable with costs for PWR reactors because the spent fuel is more easily handled (no fuel criticality). The same is true with the cost and space requirements for the permanent disposal of the waste. In 2005 the NWMO decided to build a deep repository dedicated to store the spent nuclear fuel underground. The $24 billion price tag of this 500- to 1000-metre underground vault is to be paid by a trust fund backed by the nuclear production companies. The spent fuel bundles would be placed in steel baskets wrapped together 3 by 3 (324 fuel bundles total) in corrosion resistant copper to form containers designed to last at least a 100,000 years. The containers would be encased in the tunnels of the repository by swelling bentonite clay but remain retrievable for approximately 240 years. Since 2010, the process of identifying a proper place for such a long-term facility has been ongoing. Out of 22 interested communities, eight located in Northern Ontario and Bruce County, are being studied as potential sites. According to a 2012 poll by Innovative Research Group, on behalf of the Canadian Nuclear Association, 37% of Canadians are in favour of nuclear power, while 53% oppose it. Both of these figures represent a drop from 2011 (38% and 56% respectively), and the population that neither supports nor opposes or did not know their opinion has grown to 9%. Support ranges from a high of 54% in Ontario to a low of 12% in Quebec. Other notable demographic details include men being generally more supportive of nuclear power than women, and older populations being slightly more supportive than younger populations. There was not a significant change in opposition to nuclear power in Canada following the March 2011 events at Japan's Fukushima Daiichi Nuclear Power Station (from 54% to 56%), and the issue was followed at least somewhat closely by 70% of Canadians polled. Canada has an active anti-nuclear movement, which includes major campaigning organizations like Greenpeace and the Sierra Club. Greenpeace was founded in Vancouver by former Sierra Club members to protest nuclear weapons tests on Amchitka Island. Over 300 public interest groups across Canada have endorsed the mandate of the Campaign for Nuclear Phaseout (CNP). Some environmental organizations such as Energy Probe, the Pembina Institute and the Canadian Coalition for Nuclear Responsibility (CCNR) are reported to have developed considerable expertise on nuclear power and energy issues. There is also a long-standing tradition of indigenous opposition to uranium mining. The province of British Columbia firmly maintains a strict no-nuclear policy. The Crown corporation, BC Hydro, upholds this principle by "rejecting consideration of nuclear power in implementing B.C. 's clean energy strategy." ^ a b "IESO Supply Overview". www.ieso.ca. Independent Electricity System Operator. Retrieved 2017-09-15. ^ "PRIS - Reactor Details". www.iaea.org. International Atomic Energy Agency. Retrieved 16 September 2017. ^ a b c "Ontario's Nuclear Generating Facilities: A History and Estimate of Unit Lifetimes and Refurbishment Costs" (PDF). ^ Babin, Ronald (1984). L'option nucléaire (in French). Montreal: Boréal Express. pp. 66–70. ISBN 2-89052-089-7. ^ Webster, Paul (2012-09-12). "Will CANDU Do?". thewalrus.ca. Retrieved 2016-08-23. ^ a b "Purepoint Uranium Group · Nuclear Power in Canada". www.purepoint.ca. Retrieved 2016-08-17. ^ Ahluwalia, Raj (1997-08-13). "Trouble for Ontario's Candus". CBC Archives. Retrieved 2016-08-18. ^ "Refurbished Bruce approaching full strength". www.world-nuclear-news.org. 2012-10-18. Retrieved 2016-08-20. ^ "Point Lepreau costs could hit $3.3B, PMO memo says". cbc.ca. 2013-07-11. Retrieved 2016-08-17. ^ "Un nouveau permis sera recommandé pour Gentilly-2". www.tvanouvelles.ca (in French). 2016-03-08. Retrieved 2016-08-20. ^ Shawn McCarthy (March 21, 2011). "Canada's nuclear plants ordered to review safety after disaster in Japan". The Globe and Mail. ^ Canadian Nuclear Safety Commission (March 5, 2012). "IAEA report confirms the effectiveness of Canada's nuclear regulatory framework". Canadian Nuclear Safety Commission. ^ "Pickering Nuclear Generating Station Life Extension". www.cela.ca. Retrieved 2016-08-19. ^ "Pickering nuclear reactors can exceed design operating limit". thestar.com. 2014-06-03. Retrieved 2016-08-19. ^ "Ontario unveils $12.8-billion Darlington nuclear refurbishment". www.cbc.ca. 2016-01-11. Retrieved 2016-08-19. ^ a b Nuclear Fuel Waste Projections in Canada – 2015 Update. Nuclear Waste Management Organization. 2015. ^ a b Bratt, Duane (2012). Canada, the Provinces, and the Global Nuclear Revival. McGill-Queen's University Press. pp. 132–141. ISBN 978-0-7735-4069-9. ^ John Spears (April 26, 2012). "Ontario zeroes in on two nuclear reactor designs". Toronto Star. ^ Canadian Nuclear Safety Commission (August 17, 2012). "CNSC Issues a Site Preparation Licence for OPG Darlington Nuclear Power Plant Projectl". Canadian Nuclear Safety Commission. ^ "New nuclear reactors for Darlington cancelled". www.durhamregion.com. 2013-10-10. Retrieved 2016-08-20. ^ "Bruce Power dropping Alberta nuclear plant proposal". cbc.ca. 2011-12-12. ^ "New Brunswick deals with Areva". www.world-nuclear-news.org. 2010-07-09. Retrieved 2016-08-23. ^ Bickis, Ian (2016-02-22). "Canadian startups bet on reimagined nuclear power to replace fossil fuels". metronews.ca. Retrieved 2016-08-22. ^ "Terrestrial Energy Awarded $5.7 Million Grant From Canadian Federal Government". 2016-03-04. Retrieved 2016-08-22. ^ "Next Big Future: Malaysia invests $27-million in Canada's General Fusion startup who will begin building full scale prototype in 2017". www.nextbigfuture.com. 2015-05-19. Retrieved 2016-08-22. ^ "CANSIM Table 127-0001 Electric power statistics". statcan.gc.ca. Retrieved 2016-09-11. Lay summary. ^ Nuclear sector Focus. EACL. 1996. pp. F-18. ^ a b Nuclear sector Focus. EACL. 2001. p. 131. ^ a b c Nuclear Power Reactors in the World (PDF). Vienna: International Atomic Energy Agency. 2016. pp. 18, 32–33, 48. ISBN 9789201037169. ISSN 1011-2642. ^ "La production d'électricité disponible par source d'énergie (1986-2011)". mern.gouv.qc.ca. Energie et Ressources naturelles Quebec. Retrieved 2016-09-01. ^ "Nuclear History". www.science.uwaterloo.ca. Retrieved 2016-08-22. ^ Kosarenko, Yulia. "CANDU Reactors". www.candu.org. Archived from the original on 2012-02-25. Retrieved 2016-08-22. ^ Nuclear Power Reactors in the World (PDF). Vienna: International Atomic Energy Agency. 2016. pp. 32–33, 48. ISBN 978-92-0-103716-9. ISSN 1011-2642. ^ "RRDB Search". nucleus.iaea.org. Retrieved 2016-08-18. ^ "Manitoba's forgotten nuclear accident". ^ Jedicke, Peter. "The NRX Incident". cns-snc.ca. Retrieved 2016-08-22. ^ "The American Experience: Meltdown at Three Mile Island". PBS. Retrieved 2007-06-29. ^ a b c "A closer look at Canada's nuclear plants". CBC News. Jan 9, 2012. ^ Taylor, Dave (2011-03-24). "Manitoba's forgotten nuclear accident". www.winnipegfreepress.com. Retrieved 2016-08-22. ^ "Canada's nuclear reactors: How much safety is enough?" (PDF). 2001. p. 11. ^ "Nuclear plant spills tritium into lake". 2011-04-12. Retrieved 2012-03-27. ^ Bobbi-Jean MacKinnon (Jan 9, 2012). "Nuclear commission says Point Lepreau leaks 'unsettling'". CBC News. ^ a b c Feiveson, Harold (June 2011). "Spent Fuel from Nuclear Power Reactors" (PDF). The International Panel on Fissile Materials. ^ Rouben, B. (1997). "Fuel Management in CANDU" (PDF). canteach.candu.org. ^ World Distribution of Uranium Deposits (UDEPO) with Uranium Deposit Classification (PDF). International Atomic Energy Agency. 2009. p. 11. ISBN 9789201105097. ISSN 1011-4289. ^ "Mineral Reserves". www.cameco.com. 2013. Retrieved 2016-08-18. ^ "About Uranium". nrcan.gc.ca. Retrieved 2016-08-21. ^ "Blind River Refinery". www.cameco.com. Retrieved 2016-08-22. ^ "GE and Hitachi Alliance Announces Sale of GE Hitachi Nuclear Energy Canada". geh-canada.ca. Retrieved 2016-08-22. ^ "What We Do". geh-canada.ca. Retrieved 2016-08-22. ^ "Whiteshell labs closes underground facility forever". www.winnipegfreepress.com. 2010-08-12. Retrieved 2016-08-20. ^ "Near Surface Disposal Facility". www.cnl.ca. Retrieved 2016-08-20. ^ "Deep Geologic Repository". www.opg.com. Retrieved 2016-08-20. ^ Allan, C.J. ; Dormuth, K.W. (1999). "The Back End of the Fuel Cycle and CANDU" (PDF). International Atomic Energy Agency (IAEA-SM-357/10). ^ MacInnes-Rae, Rick. "Canada narrows list of possible locations for nuclear waste facility". cbc.ca. 2014-04-09. Retrieved 2016-08-23. ^ "Study Areas". www.nwmo.ca. Retrieved 2016-08-20. ^ Innovative Research Group (July 9, 2012). "2012 Public Opinion Research: National Nuclear Attitude Survey" (PDF). Canadian Nuclear Association. ^ Lutz Mez, Mycle Schneider and Steve Thomas (Eds.) (2009). International Perspectives of Energy Policy and the Role of Nuclear Power, Multi-Science Publishing Co. Ltd, p. 257. ^ "Page or File Not Found". Archived from the original on 2012-02-01. Brian Buckley (2000). Canada's early nuclear policy: fate, chance and character. McGill-Queen's Press – MQUP. ISBN 978-0-7735-2077-6. G. Bruce Doern; Robert W. Morrison; Arslan Dorman (2001). Canadian nuclear energy policy: changing ideas, institutions, and interests. University of Toronto Press. ISBN 978-0-8020-4788-5. Gordon, H. E. Sims (1990). The anti-nuclear game. University of Ottawa Press. ISBN 0-7766-0285-3. Gordon, H. E. Sims (1980). A history of the Atomic Energy Control Board. Canadian Govt Publishing Centre. ISBN 0-660-10812-7.